There is no reason why you cannot exercise with your bike when the weather outside is bad. This magnetic resistance bike trainer converts your bike into an indoor cycling trainer. It offer effective indoor training in a stiff, well supported steel frame. This trainer is easy to set up with almost any bike--including road and mountain bikes with a 26", 27", or 700c wheel. Fine-tune to your wheel and tire size with the micro-adjust knob. As you pedal, the internal magnet creates resistance, with 5 levels of resistance. You can change them right from your handle bars. ☀[Easy and quick to assemble] The bike trainer was easy to put together. Usually takes about 10 minutes. This bicycle trainer is pretty self explanatory. ☀[Very sturdy, Well built, Quiet running] On and off are a breeze. If you are looking for a portable indoor bike trainer, look no more. Get a front wheel chock for front end stability and leveling. ☀[Magnetic Bike Trainer] This bike trainer, like many, uses magnets to provide resistance when pedaling, there's a number of methods that other bike trainers employ to provide resistance but magnetic ones seem to be a good compromise among factors like durability, resistance levels, loudness/quietness. 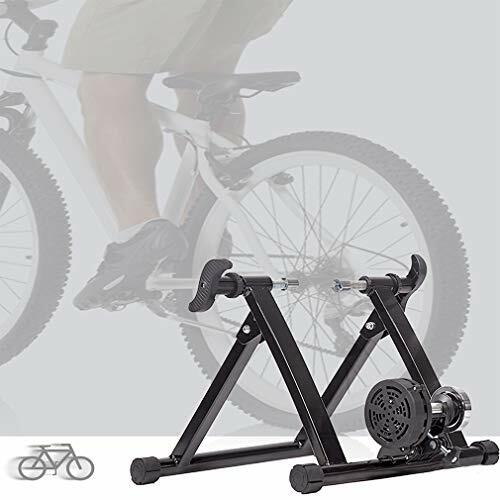 ☀[100% SATISFACTION GUARANTEE] We guarantee you'll love this bike trainer. But if you're not satisfied with this bicycle trainer, please get in touch with us.